People often make fun of Nordic walkers who apparently just stroll around with sticks in their hands. People who do not do Nordic walking often question the training effect of Nordic walking. “Real” athletes rather leave their sticks at home and go for a jog. However, Prof. Dr. Bettina Schaar’s scientific investigations have proved that Nordic walking should be taken seriously, as it does have positive training effects. In certain circumstances it should even favoured over running. Scientific investigations carried out at the German Sport University Cologne (project group Schaar) have shown that walkers in contrast to Nordic walkers are faster. Depending on the intensity of the use of arms or sticks the cardio-vascular system is strained. 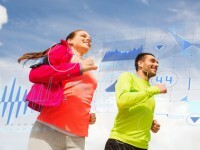 So, the more you use your arms – with or without sticks – the more your heart and respiratory system is trained. A man weighing 75 kg activates about twelve to 15 kg of his muscle mass. In contrast to running the risk of injuries and overload are reduced when doing Nordic walking. Then the vertical impact load is up to three times lower than when running. This is due to the fact that one foot always stays in contact to the ground. Further scientific investigations have discovered that when walking and running the body weight distribution on the foot is different. While walking there is more pressure on the heels, whereas when running there is more pressure on the mid foot. When doing Nordic walking on a regular basis your endurance performance will rise, the mobility in the region of the cervical and thoracic spine will improve and neck and shoulder problems will be reduced, too. Due to the lower load component Nordic Walking is particularly good for beginners and returners to the world of sports who have a rather low endurance capacity. 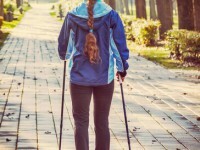 People who suffer from orthopaedic damage and who need to look for a sport that is easy on their joints, should try out Nordic walking to train their endurance, too. So, instead of going for a jog take your sticks and start Nordic walking!